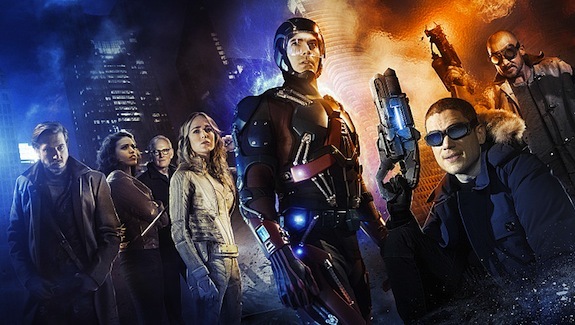 The CW is expanding its DC universe with the upcoming THE FLASH/ARROW spinoff, LEGENDS OF TOMORROW. DC’s Legends of Tomorrow — Image LGD01_JN_0001 — Pictured (L-R): Arthur Darvill as Rip Hunter, Ciara Renee as Kendra/Hawkgirl, Victor Garber as Professor Martin Stein, Caity Lotz as White Canary, Brandon Routh as Ray Palmer/Atom, Wentworth Miller as Leonard Snart/Captain Cold, and Dominic Purcell as Mick Rory/Heat Wave — Credit: Jordan Nuttall/The CW — ÃÂ© 2015 The CW Network, LLC. All Rights Reserved.